This web site does not exist for the purposes of selling puppies. As was stated on the homepage, we breed for show dogs and have been amazingly successful in that almost all of our puppies have been show quality and have been very successful in the showring. Moreover, since our breeding program is also very limited in size, availability of pet-quality puppies is very unlikely. At the same time, we do sometimes have available show-prospect puppies or adult dogs that will no longer be shown and/or bred. Gangway has Puppies! We very rarely have puppies, but have both pet and show prospect puppies. This is your chance! 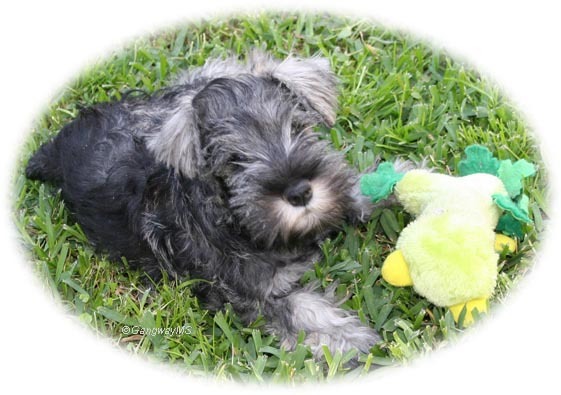 Most people seeking a new Schnauzer want a puppy female. Let me advertise the merits of males and older experienced pets. Almost all the Miniature Schnauzer breeders I know, who have lived with the breed for years, prefer males as their personal pets. Males who are properly trained usually experience less problems with respect to "accidents" than females. In addition, males are less moody and are usually more playful into the later stages of their lives. And the older dogs that come from me were raised as house pets and have gone to the office with me on a regular basis. They are well-adjusted, beautiful animals with a distinguish- ed show career and are comfortable in most any situation. I have placed a number of such dogs and the positive experience has been universal. Bringing a puppy (or adult) Miniature Schnauzer into your home brings with it a serious responsibility on your part as the new owner toward the new family member. As the breeder I also have a responsibility to the puppy (dog) to ensure that it lives a healthy and fulfilling life in its new home. Consequently, obtaining a Gangway puppy (dog) is not easy and involves convincing me that an appropriate home will be provided. And after the puppy (dog) has come into your home owning a Gangway dog involves a continuing relationship with me as I sometimes monitor its conditions. These dogs make outstanding pets and family members and deserve no less a commitment on my part or yours. Before acquiring a dog, you should engage in a serious investigation as to the nature of the Miniature Schnauzer and its suitability for you needs. You should also thoroughly investigate any breeder that you might buy a dog from to insure their reputability. A good place to start the investigation is the American Miniature Schnauzer Club web site. This site provides a lot of good information and recommendations on how to go about your search. Also the links section can be viewed by clicking on the links button and points to a number of additional good sources of information. Good luck in your search!